A contributor from Los Angeles, California owns one of the most elegant cars ever produced, a Sunbeam Alpine convertible. Alfred Hitchcock fans would know it as the star of the film To Catch A Thief—that is, starring along with Cary Grant and Grace Kelly. Our contributor wants to know if his roadster could possibly be the same one that was used in the film, as he was told when he purchased the car. History Detectives heads for the bright lights of Hollywood to revisit the glamour of 1950s movie-making, and rub elbows with some of the key players inside Hitchcock’s circle. And along the way, they learn a lot more about a beautiful car and its beautiful possible occupants. Do you have a Sunbeam Alpine? 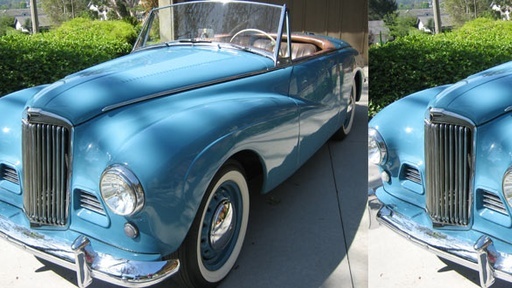 Join our search for the vehicle driven by Grace Kelly in To Catch a Thief. Also with Elyse Luray Space Boot What does this odd-looking boot have to do with America's first steps in space? Related Investigation Early Monopoly Could this be the earliest version of the world's best-selling board game? Also with Elyse Luray Black Star Line Is this certificate a rare artifact from the heyday of Marcus Garvey? Also in Post War: 1945-1960 Manhattan Project Letter Did this letter help persuade President Harry S. Truman to change policy in the post war era? Also in Season 4 Vicksburg Map Could this mysterious map have been at the front lines of one of the most explosive battles of the Civil War?